Provide comfort for the family of Luigi Cassano with a meaningful gesture of sympathy. The youngest son of nine children born to Angelina Grillo Cassano and Francesco Cassano, had an amazing life as a first generation American to Italian born parents from Naples. Louie and his siblings were encouraged to speak English and to assimilate quickly as American children. His parents owned an Italian bakery on Linden Street in Queens. Louie worked in the bakery and with his brothers, drove to deliver fresh bread in the neighborhood. Imported cheeses and salames hung from the ceiling. They ate well. 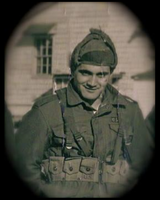 Lou graduated from Flushing High (the oldest public school in the US) and joined the Army. 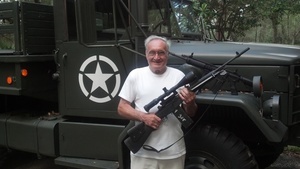 He was stationed in Japan where he was both a radio operator and an excellent marksman. He made many friends and loved his years in the Army. After the Army, he became a mail carrier. One weekend, he and his pal noticed Dianne Wilma Neligan and her sister Ardys, at a bus stop. The men were movie-star handsome and charming, so the sisters accepted an offer to drive them home to the Bronx where they lived. Dianne and Louie raised four children Claire, Craig, Gayle Angela, and Glenn. 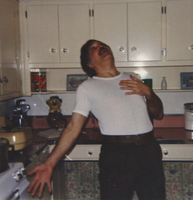 Louie owned a tavern in Flushing called Cassano’s Lounge, a neighborhood gathering spot for parties and dancing. Their children would learn to dance here while playing the jukebox, watching the 45’s drop down from their places in the rack and the needle arm move over to its place to begin the music. It was the sixties and patrons were transitioning from Frank Sinatra to Nancy Sinatra and go-go boots. Papa Luigi, as his daughter called him, lived with Claire and her family for the last sixteen years, following them from California to Idaho. He loved living in Hailey, Ketchum and then Bellevue. He loved the mountains. He said it was his favorite place. Louis is survived by his wife, his four children, his grandson Conor Rocco Murray, three sisters, Madeline, Lillian and Antoinette, and many nieces and nephews. A memorial lunch will be served on Saturday, April 13th at 11:30 in the Sweetwater Community Room, in Hailey. Friends and family are invited to make a final toast to this kind and gentle man who walked all over Hailey with his cane making roses bloom. The family requests that offerings may be made in his name to Wood River Hospice. To send flowers in memory of Luigi "Louis" Cassano, please visit our Heartfelt Sympathies Store. We encourage you to share your most beloved memories of Luigi here, so that the family and other loved ones can always see it. You can upload cherished photographs, or share your favorite stories, and can even comment on those shared by others.